The Super Eagles are back. Nigeria’s greatest image makers and international brand ambassadors are back again. This weekend the Super Eagles resume their Africa Cup of Nations 2019 qualifier campaign in the city of Uyo, Akwa Ibom State. 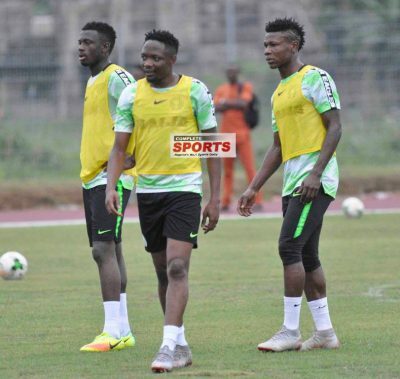 A new look national team led by Ahmed Musa, Nigeria’s 2018 World Cup hero, will take on the Mediterranean Knights of Libya twice within a space of three days (the second leg match comes up the following Tuesday in Tunisia, where the Libyans now play their international matches as a result of the insecurity in their own country) to determine who, between the two teams would be at AFCON next year. Had Nigeria survived the match against Argentina, one that they had wrapped in their pocket up till close to the end of the encounter, the Super Eagles, weak as they were, could still have progressed to the quarter finals at least. That is the exaggerated opinion of some of us that are both pundits and patriots. Ahmed Musa – a Captainship Burden. Stephen Keshi as captain of the national team and New Nigerian Bank FC also did that very effectively. They were both good examples of what it takes combine the roles of key player and captain of a team. He does not look to me as such a consistent player, with a very strong enough personality and presence on the field, that can effectively combine the multiple roles. A player that is routinely substituted during matches is not good captain material. My friend, Tunde Kelani, came to see me the other day after listening to a lecture about the history of the Oyo Kingdom in the palace of the Alafin of Oyo by a renowned Nigerian scholar. Since USA ’94, without question, Nigeria’s reputation as a football country has grown globally. Unfortunately, not enough to overshadow its image as a corrupt African State with a good leadership-deficit that cannot convert its humongous resources and opportunities into prosperity. Sport is a natural activity for the Black person on earth for various reasons. The genetic evidence is in Brazil, in Jamaica, in the USA and the UK through the number of Blacks representing those countries at the highest levels of sport. Odegbami: Super Eagles – The Black Man’s Burden, Responsibility And Hope! Odegbami: The War In Uyo – The Super Eagles Versus The Desert Foxes! Odegbami: The Super Eagles Landed Safely!